N. A. Cauldron writes books for all ages. While fantasy and science fiction usually pique her interest; humor, character conflict, and smart-aleck dialogue are her favorite go to’s. She currently resides in eastern Cupola with 12 gramwhats, three cats, and a herd of domesticated moths. I found Ms. Cauldron’s official description on her website. I have to admit that I’m trying to read more middle-grade novels. My granddaughter loves to read, and I want to make sure I always have a list of books that I approve of for her to read. It’s crucial for a grandmother to make sure the books her grandchild reads are clean and have a message. 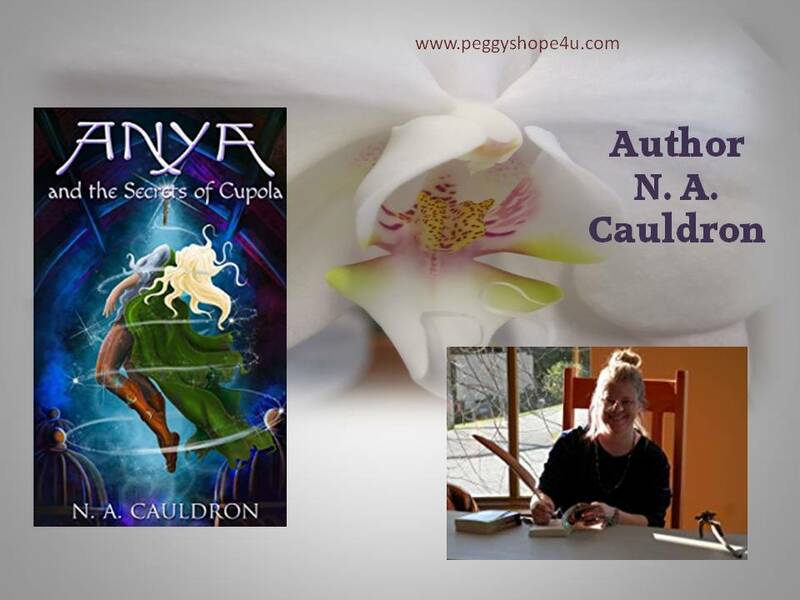 N. A. Cauldron fills those requirements in Anya and the Secrets of Cupola. 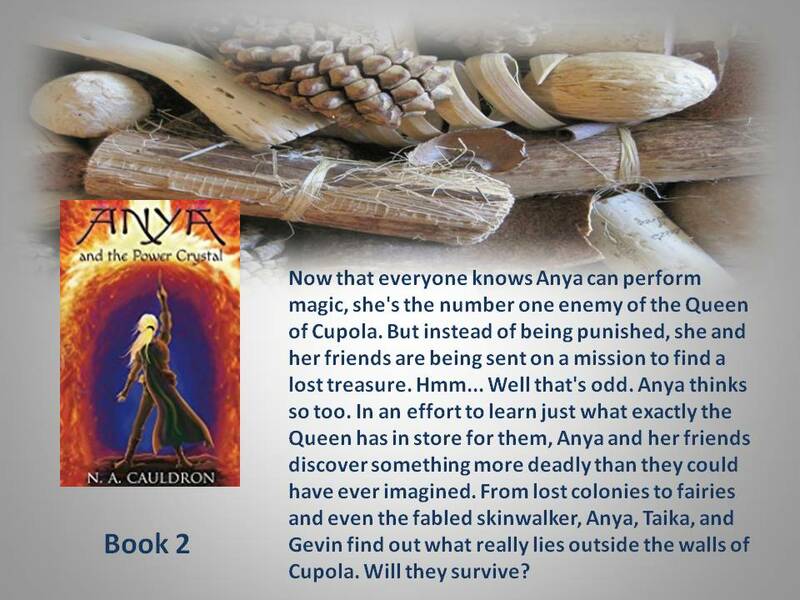 N. A. Cauldron brings you Anya! Deep in the walls of Cupola lies a secret. A 200-year-old magical secret. And it’s up to Anya and her friends to solve it. Meet Anya, a twelve-year-old girl with utterly no direction in life. Meet Taika, her best friend who can make a potion strong enough to cure a weregoblin, but may forget to warn you that it can explode at any moment. And then there’s Gevin. Yeah … well … Gevin’s just Gevin isn’t he? These three unlikely heroes will have to brew potions, battle monsters, and even endure the night-of-the-overturned-chicken-stool before discovering the deepest mysteries of Cupola. When I pick up a book, I’m looking for characters I find engaging, lessons that will stay with me, and a story that makes me believe we can all work together to create a better world. This book includes all that. Anya is a child who makes the best of everything, even when life has handed her very few choices. Taika is one of those people who believe they can achieve their goals, regardless of whether or not they have all the tools necessary to pull it off. Then we have Gevin. I adored Gevin. He’s the kid who seems to bumble his way through all the obstacles in life and somehow come out unscathed. 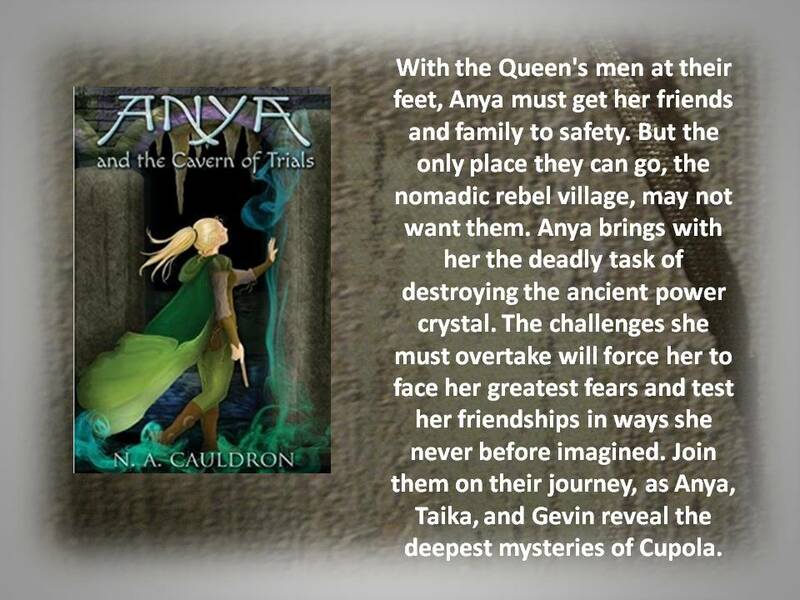 “Anya and the Secrets of Cupola” is a story of human love and cooperation. Regardless of the challenges of a somewhat tyrannical queen, the kids continuously keep the better good of their families and their fellow citizens as their primary inspiration. That in itself is a grand reason to share this story with your teen. The world is believable, the magic necessary, and the lessons impressive. Anya will inspire kids by her handling of the bully Cannis. Sometimes we have to forget getting even and look at the bigger picture. As the three kids begin to unravel a two-hundred-year-old secret held tightly by the Queen, they will encounter a witch, a crazed monkey, a man as old as the Queen’s secret, a rather nasty troll, and some heat crazed lava lizards, oh my! Anya has lived with loss her entire life, but now she has an opportunity to restore that which was. I highly recommend this book for kids 12+. I had an opportunity to chat with N. A. Cauldron to ask her some questions about the series. I firmly believe books directed at children need to emphasize the qualities we want to see in our young people. I loved the way Anya not only accepted her duties at work but pitched in at home. Did you have chores as a kid and what are your thoughts on helping kids develop a sense of responsibility? Actually, no. I mean … sorta. See, I had to mow periodically, and I was supposed to dust, but other than that, I never had to do anything. I think I dusted twice. Seriously. Twice. I think my mother was “It’s easier if I just do it.” And I agree. It is easier to do it yourself, but it’s made adulting much harder for me. I taught myself how to cook, how to clean, how to everything. I cook very well, but my cleaning is lacking, to say the least, and I don’t have the drive to do it like I should. It is for this very reason I gave my son the chores I did. He’s fourteen. He can fix all his own meals, waters the cattle, feeds the animals, and often offers to fix us meals for no reason other than he likes to cook. I also make him clean his bathroom every week. So, part of Anya’s caring nature probably came from him. My son is very compassionate. But yes, it was also to instill a point to children out there who are living the choreless life I did. How did you choose Anya’s sidekicks? I was just thinking about this the other day. So, I honestly looked at what was hot in the market at the time and knew I had to have a trio. I didn’t want to have two boys and a girl that would be too Harry Potter and compared to it too much. The series wound up getting compared to it all the time anyway, so that was obviously pointless, but that’s why I chose that part initially. I love character conflict and bantering and good old-fashioned sit-coms. If you look at the character interactions, you’ll see a lot of that. There also seemed to be typical characters that were needed in most stories. There’s always a nerd, a comic relief, that sort of thing. So that’s where Taika and Gevin came from. Most of my stories have a Native influence, so Taika became Native American. And Gevin was just Gevin. I mean, he just popped into my head and wouldn’t shut up! I still love him dearly. Which character most resembles you during your teen years, and why? Not Anya! Probably Taika. All brain and no social skills. They all three come from me now. I’m still a brainiac, to a degree, have Gevin’s smart-aleck mouth, and Anya’s fighting spirit and terrible luck. Will there ever be a fourth book in the series? The series was originally four books. I don’t really know why I haven’t written a fourth yet. The third does bring it to a closure, so I don’t feel readers are going to feel cheated or hanging. While there are no immediate plans to writing one, I’m not opposed to it by any means. When N. A. Cauldron isn’t writing, what is her favorite pastime? I’m sure every mother understands the inability to allow themselves to get engrossed with anything after they have children, even when they’re grown, so most of my spare time comes in tiny bursts. This means my gaming can’t be epic like when I was younger. I mainly play strategy and time management games now, though The Longest Journey and Beyond Good and Evil always find a way to get played now and then, along with Dark Cloud and a couple of others. My family is made of avid gamers. We have emulators, and old systems plugged in and used just as much as the new. Please share with our readers what things you enjoy most about writing. Discovering the story: I like to put the pieces together, to see how I can make two or more things fit seamlessly. I like to challenge myself. Can I write in this style? Can I make a character I know nothing about be authentic? The release. There’s just something about typing that does it for me. Writing longhand doesn’t, but hearing the keys click and watching the words appear on the screen… Sometimes they come out on the own. That’s the best part. I’ll be really into it, and the next thing I know, I’ve typed something I’ve never even thought. Sometimes I let it go and see where it takes me. Others I jerk back in surprise. “Cool! I didn’t know that!” I also love hearing from readers. That’s probably the best part.